Today, I woke up and logged onto my laptop to have my day made by the fact the cover for Geek Girl: Model Misfit would be revealed later that day! After a really busy day yesterday, this made me forget about how tired I was and the fact all I wanted to do was go back to bed! 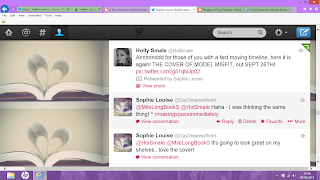 As I waited for the cover to be revealed(By Holly on twitter by a countdown that reminded me of New Years) I was chatting to Lucy, Sunny and Amber about our love for the first book. I'm so excited to get back to Harriet's life and find out what is happening. Also, I loved all of the other characters and can't wait to see the likes of Nick and Wilbur again! Harriet knows that modelling won’t transform you. She knows that being as uniquely odd as a polar bear isn’t necessarily a bad thing (even in a rainforest). And that the average person eats a ton of food a year, though her pregnant stepmother is doing her best to beat this. What Harriet doesn’t know is where she’s going to fit in once the new baby arrives. With summer plans ruined, modelling in Japan seems the perfect chance to get as far away from home as possible. But nothing can prepare Harriet for the craziness of Tokyo, her competitive model flatmates and her errant grandmother’s ‘chaperoning’. Or seeing gorgeous Nick everywhere she goes. Because, this time, Harriet knows what a broken heart feels like. 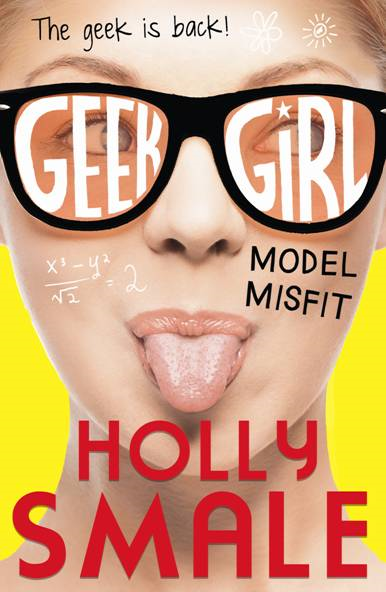 Can geek girl find her place on the other side of the world or is Harriet lost for good? To begin with, isn't it gorgeous! 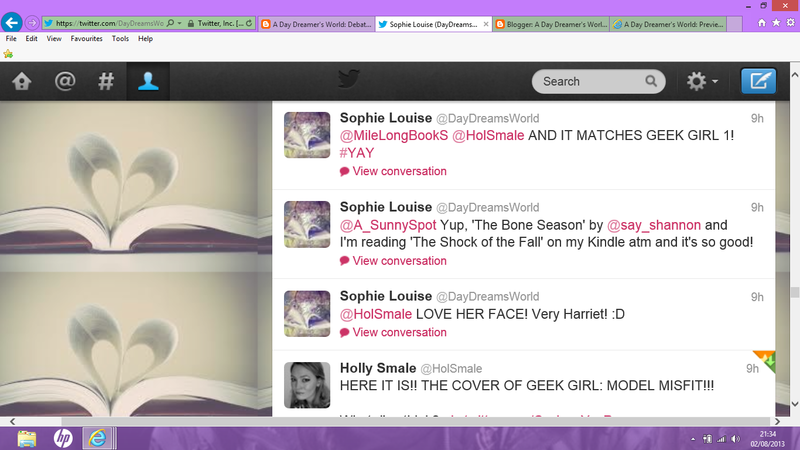 The first thing I tweeted after seeing this cover was how it resembles Harriet's personality perfectly. It's fun and fresh, and with the slanting font it makes you think of how out-of-place Harriet feels sometimes. Her tongue is poking out and it makes me want to laugh already - this is definitely the perfect cover to follow. Models are supposed to take things seriously, and it seems like she's having so much fun here and is too busy to think about that. So, it does make her seem like a misfit of sorts! I also love the colours on the cover just look at the yellow! It's so vibrant! 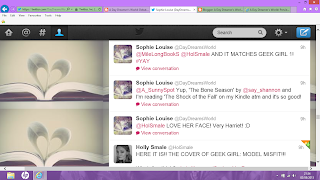 It also matches the first book, Geek Girl. It's definitely a pet-peeve of mine when the covers don't match, but these definitely do! I'm really looking forward to admiring Model Misfit on my shelf next to GG1. My first reaction to the cover! I'm just so excited to have this on my shelf and finally get to read it! I've already been assured there is more Nick in this book(Thank you so much, Holly) and now I have a cover to admire until it's released on September 26th! This has come around so quickly compared to other books, I cannot express how happy I am that it isn't a year wait like most novels. So, what do you think of the cover? Tell me in the comments! You should! It's amazing, and packed full of humour! I'd love to hear what you think when you do read it. I need someone to chat about Nick with! Hehe... Cover love :P Although *sniffles* neither of them are on my shelves I would like them to be... They look amazing & do match. Hope spines are just as much of a hit ;) It is quite easy to not read Geek Girl, the thing is when people have such big TBR's & there ARE so many great books it's sensible to read what you've got. In other words, I'm saying once again, I HAVE NO GEEK GIRL. Hold me.